Hillary Clinton is maintaining a 50-point lead over Donald Trump among Latino voters heading into the final weeks of the presidential election, and more Latinos now say they they're very interested in the November contest, according to a new NBC News/Wall Street Journal/Telemundo poll. 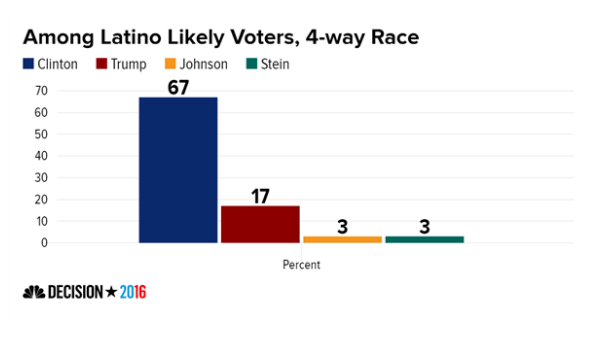 The poll found that 67 percent of Latino likely voters back Clinton in a four-way matchup, while just 17 percent back Trump. Libertarian Gary Johnson and Green Party candidate Jill Stein each garner three percent support. 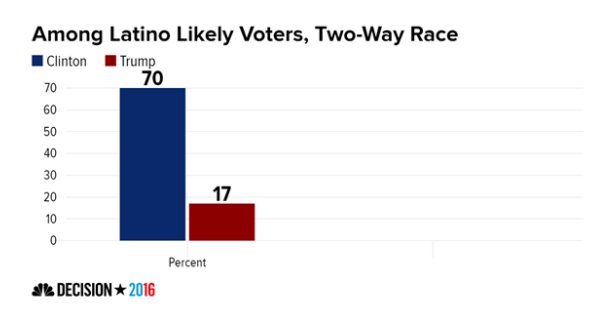 In a head-to-head matchup, Clinton leads Trump among Latino likely voters, 70 percent to 17 percent. Clinton's margins are similar to the advantage she enjoyed in a mid-SeptemberNBC/WSJ/Telemundo oversample of Latino voters. But the new data also show that interest in the election among Latinos has increased. That's a boon for the Democratic candidate as she works to build a winning coalition in an election cycle that pits two historically unpopular candidates against each other. Sixty-nine percent of Latino voters now say they are very interested in the election, compared to 60 percent who said the same last month. And more than eight in ten - 82 percent - say they are absolutely certain to vote, a share that rivals pre-election polling before President Barack Obama's win in the 2012 presidential election. What's more, the increase in interest in the election among Latinos has come largely from groups most likely to support Clinton, including younger voters, Democratic-leaning Latinos and those who speak primarily Spanish. Trump's favorability among Latinos remains strikingly low. The new poll shows that 80 percent view him negatively, compared with just 13 percent who view him positively. Hillary Clinton is viewed positively by 59 percent of Latino voters, while 28 percent disagree. About half of Latino voters - 54 percent - said that the presidential debates made them more likely to support Clinton, while only eight percent said the same of Trump. Thirty-five percent said that the debates made no difference in how they will vote.